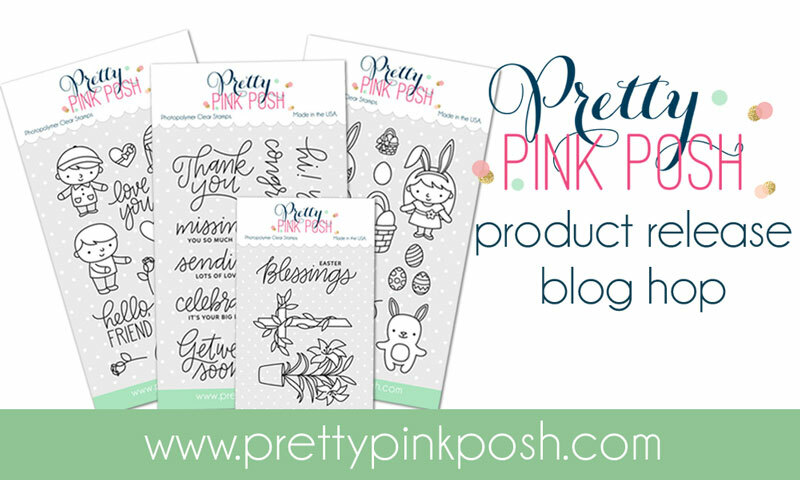 Hello everyone, welcome to the March 2017 Product Release Blog Hop hosted by Pretty Pink Posh! I'm super excited to be joining in on the fun today with all these other amazing designers. The blog hop is two days long and there is 25 different designers helping celebrate this product release, which is absolutely amazing! 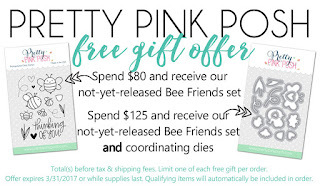 Also with this release, there is a free gift with orders over $80, so be sure to check that out also! There are four $25 gift certificates up for grabs (2 winners each day) and all you have to do is leave a comment on the blogs to be entered to win. 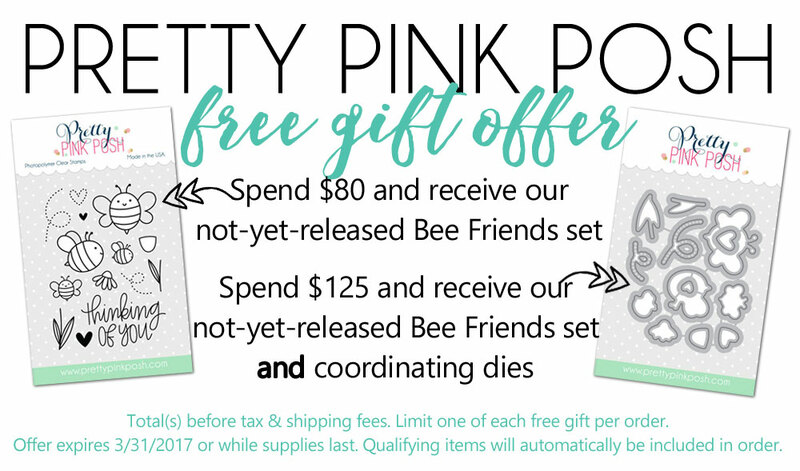 Comments must be left by 11:59PM PST time on the 17th March 2017 and then the winners will be announced on the Pretty Pink Posh blog! Okay, so now onto the hop! You should have made your way here from the amazing Amy Yang's blog. Okay, now we've got all through the details of the hop, let's move onto the card I made. I used the new Easter Friends, Stitched Notes Dies and Scalloped Square Tag Dies and Fresh Garden Sequin Mixes (4mm & 6mm) to create my projects today. To begin my card today I stamped out all the images I wanted to use from the Easter Wishes stamp set on some white cardstock with Memento Tuxedo Black ink. I then used various Copic Markers to colour in my images. Aren't these images just the cutest?! Anyway, for my colour inspiration today I used the Fresh Garden Mix and pulled the colours out of that to use on my card today. Once I had finished colouring I used the coordinating dies to cut out all my images. Once they were cut I could move onto my background. I'm using five colours of Distress Ink for the background today, again picking colours from the same sequin mix. I used Spiced Marmalade, Picked Raspberry, Wilted Violet, Peacock Feathers and Twisted Citron and water-coloured a line of each onto a piece of watercolour cardstock cut with the rectangle die from Stitched Notes. Once I was happy with how my lines looked and they were vibrant enough I heat set them with my heat tool. I then flicked some water droplets on top and picked it up with a paper towel to give that water splotch effect and then dried it once more. For my sentiment I stamped the 'Happy Easter' sentiment from the same stamp set with some black ink in the top left hand corner. I used my MISTI to help stamp it twice to get a nice black impression. Once my panel was done I could adhere my images. I used some foam tape to adhere them all together at the bottom of my card. For my card base, I was tossing up which colour of cardstock to use. I couldn't decide between the two colours so I used them both. This is a trick I use all the time and it gives the card something extra I think. Before adhering the two colours together I ran them through an embossing folder from WRMK called Quilted. I love the extra texture it gives! I then adhered the blue piece onto my card base and then the green piece that I cut at a diagonal on top. I then used a piece of fun foam behind the main panel and adhered it on top to finish it up. For a last finishing touch I pulled the same Fresh Garden Sequin Mix and adhered a few on top of their coordinating colours on the background. I really wanted to make a shaker tag from the new Scalloped Square Tags as well. So I die cut two of the largest tags out of white cardstock. Then I die cut a square out of one of them in the centre. I adhered acetate behind the one with the window cut out of and added two layers of foam tape around it. I picked out the Fresh Garden Sequin Mix once more and added some 4mm and 6mm inside and then used the Daffodil Seed Beeds to add some inside too for the noise of a shaker. Once my tag was filled I removed the foam tape and added the solid die cut tag on top. I had a couple of left over images from before so I added them on top of the acetate with foam tape also. I used my hole punch to punch a hole at the top of the tag and threaded some ribbon through. I then used some old twine from Pretty Pink Posh also and tied a bow to hold my ribbon on and that finished up both my card and tag today. I hope you enjoyed and there is a video that goes along with todays post, too! The link is below as well as the video. Thanks so much for stopping by today and remember to check out the new release, leave a comment and the next person to visit on the hop is the amazing Nichol Spohr! Love the card/tax and the video was great! I really love the your colors! The fresh garden mix is perfect for Spring! Such a sweet card. I love the background. Your shaker tag is so fun. The card is just darling! Love the cute stamp set! !The tags are super sweet! They are my favorite! !love the Fresh Garden Sequins Mix. All the colors are so vibrant! I love it, makes the cards and tag just pop. You make coloring look so easy. I love your watercolor background on your darling card and your tag is really cute too!! Your colorful projects made me smile :) The fresh garden mix is so pretty!! Great card, I love that watercolor background and the pretty shaker tag! Elose, these are too darned CUTE! What a cute shaker tag. Love it. Thanks for the video tutorial. The background is awesome! I would have never thought to do stripes. I'm a beginner so I love that you have a process video. Love the colourful stripes behind these cute images. Great projects. Adorable card and love your tag...really really cute projects!! Such a sweet card and tag! What a sweet card. Love the background. Wonderful shaker tag. That tag die is fantastic. Awesome projects. I like the spring colors. Sweet card, really loving the shaker tag!! Thank you for joining the Blog Hop! What a sweet card and cute shaker tag Eloise!!!! Please check out my blog as I host always anything goes challenges every Friday! Would love for you to join us! Love your card Ella, but your shaker tag really got me!! :) So fun and such delightful spring colors!! Love your projects, all the fabulous springy colors are wonderful. 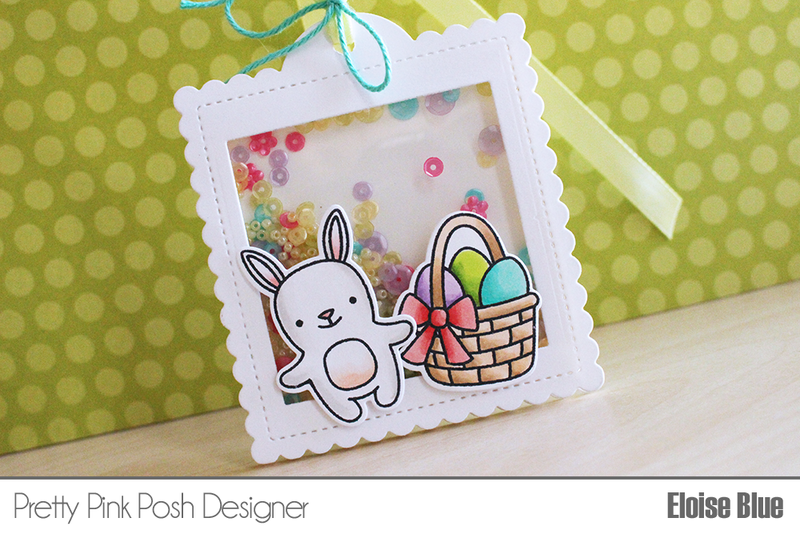 Both of your Easter projects are so sweet! Great new products from PPP! Thanks for sharing these lovely projects with us. Love the tag!!!! Very cute cards Eloise. Thanks for sharing your ideas and inspiring us. Very cute card with a great background. I absolutely love those shaker tags. Adorable Card and fun tag. I enjoyed your video so much! Awww!!!! I'm in love for these sweet and cutie creations!!! Love them!!! Really love that first card! Great inspiration! I love the window card dies. Cute scalloped edges. Oh the possibilities with the new stamps and dies - love your inspiration! Love the watercolor background on the Easter card! Adorable! Love the colors you used. The cute cards just keep coming. Lovin" it! Simply adore the little people stamps. So sweet and precious! Thanks for the inspiration! Love both your projects. The water colored stripes on your card background are perfect. Shaker Tags are a favorite of mine and yours is awesome! Thanks for sharing! So adorable!! The shaker tag is super cute. Adorable card and shaker tag, I enjoyed your video also. Love the wash in the background of your Easter card! I love your card and tag! So pretty and thank you for the video! TFS! Your card is so colorful and your tags delightful. Thanks for sharing your creativity with this new release. Beautifully done! Love your card and tag and enjoyed your video too! Thank you for sharing your amazing talent. Tags are gorgeous! Cute kids and I like the colorful background. cute shaker tag too. Love your amazing cards & tags! I always get so much inspiration from your blog! I am falling in love with those cute little images. So cute and your card and shaker tag is sweet. Love the sequins. I love the bold and bright colors!! Thank you for your inspiration!! Sweet card and shaker tag! Beautiful coloring and details! Love the new stamps and dies... awesome release! I love the watercolor background in your card, looks amazing! Great card and tag, thanks for sharing! 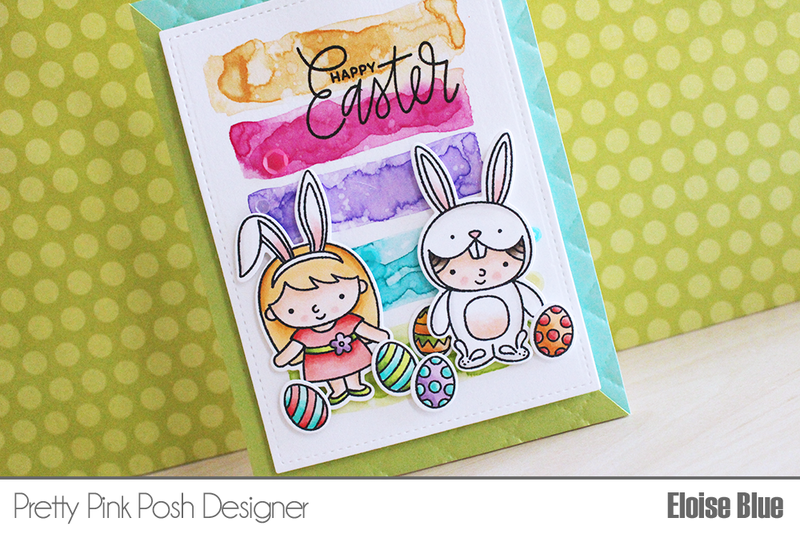 Really cute card...love the colorful watercolor background you created! Love the tags too...I think I want that die!! Awesome shaker tag and card! Such cute projects!! I love shakers! 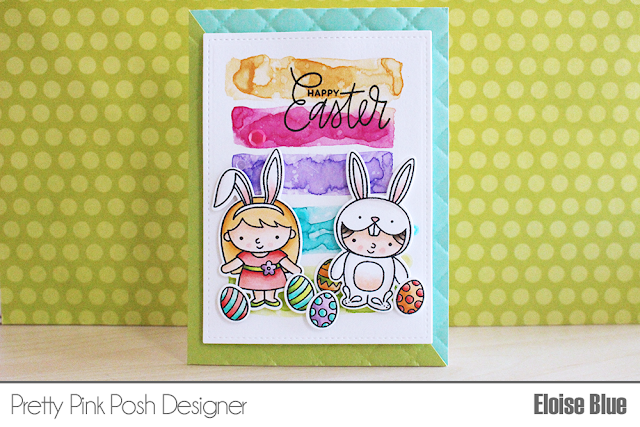 Your card is so colorful; perfect for Easter!! I love your shaker window project as well. That bunny shaker is so cute I could just squeal! LOVE the colors and the design! Wow! I love the background on your card! I'm in love with your shaker tag. So cute. beautiful cards and shaker tag! I love the colors ! Awesome! Love what you did with the arter colors!!! Adorable card and tag! Such a cute Easter stamp set...and I love the shaker tag for a treat bag! Fabulous card & shaker tag! Too adorable! I love the watercolors and the shaker card! So glad I found you on this blog! new follower and subscriber on youtube for sure! You are very talented! tfs! I love the watercolor background! The colors you picked are perfect, and the stamps are the cutest!!!! Love that background on the card! Fun, color and bright! Super cute samples! Love your colors! Cute cards and great release! Nice Job, Eloise! Great coloring and I love the shaker tag. What a great idea! Thanks for sharing with us and for participating in this fun hop and giveaway. Beautiful card and tag! I love shaker cards and shaker tags. Thanks for sharing! Such a sweet card and tag! I love the bright colors on the card's background. And the bunny on the tag is absolutely adorable! so sweet! love the watercolor bg!